Beautiful lithograph certificate from the United States Treasury issued in February 1945. 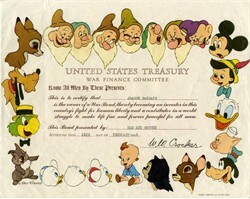 This historic certificate is bordered by multi colored Disney characters and has the printed signature of Walt Disney in the lower left hand corner next to the copyright. This item also has the highly desirable Eagle and Shield as a watermark in the certificate paper. This item has light fold creases. These certificates were issued as premiums to purchasers of U.S. WWII savings bonds. This certificate was issued 3 months prior to Germany's surrendered in WWII. W. W. Crocker was the president of Crocker National Bank.